Most people that modify their computer case will put in windows, lights, fans, a cool looking processor heat sink, and sometimes they mod their video card. 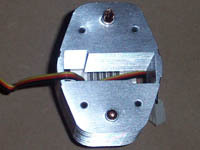 Little attention is given to other chips, such as the Northbridge. The Northbridge chip has an important role in the communication between the CPU and the memory, AGP, PCI and L2 cache, and needs to be kept cool. Cooler Master has introduced a chipset cooling mod, the Blue Ice, which will be tested on a MSI K8T800 NEO-FIS2R motherboard's chipset. 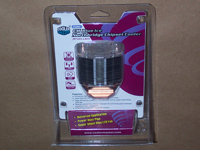 "CM Blue Ice is designed to cool down the temperature of Northbridge chipset and surrounding components. Having an efficient Northbridge cooler like CM Blue Ice will make up a high percentage of overall system activity and stability." • Fan Speed 4,500 R.P.M. The Blue Ice is packaged in a plastic snap together pack, with the accessories packaged separately. The package is more than sufficient for shipping, and will not allow any damage to the unit or other included items. Here you can see a full view of the Blue Ice. You can see that it has a copper base, a single copper heat pipe, an aluminum heat spreader, and aluminum fins. 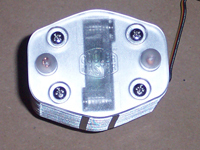 A single 3-pin plug powers the included fan. The cable is not wrapped, which was a bit of a disappointment, since something that is obviously designed to be shown off should be as complete as possible. Here is the top of the Blue Ice. 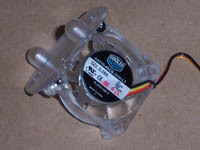 It has a plastic cover, which I found is attached to the 40X40X10mm fan. Removing the four screws you are able to remove the plastic cover and the fan. There is a single heat pipe in the Blue Ice, which pokes out of the top through the many aluminum fins. Something I noticed is that each of the fins has a separator so they remain evenly spaced. Here you can see the tiny 40mm fan after I removed it from the main assembly. 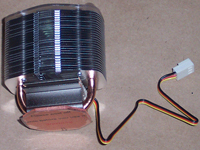 It is a standard 40X40X10mm fan, so you do have the option of replacing it. I would caution you that you have to run the power connector through the bottom of the main assembly, and unless you cut the cable or remove the power connector, you will not be able to get it through the little opening. There is a single blue LED in the fan, a dual or tri-LED fan would have been nice to give it a more powerful glow.